First, I wanted to thank all of you who support our ministry and family through prayer as we share our lives with you through this blog. 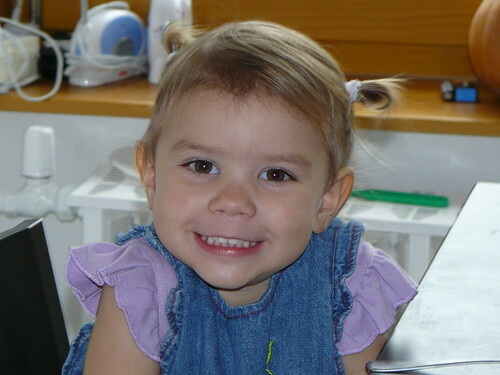 Above: Vali is a local preschool teacher who previously had Ben as a student. She has been a part of our english program for years but remains at a distance when it comes to spiritual things. Please pray for her to come to understand what it means to have a restored relationship with God through Jesus Christ. Above: Having alot of fun with our morning class. We had students blindfolded while other class mates had to give them directions to hidden chocolate while avoiding obstacles placed throughout the room. 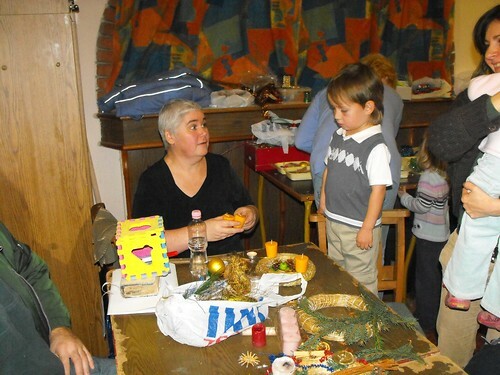 Above: Heidi took a portion of class time to teach about our celebration of Thanksgiving. At one point, we had the students think of a few things they were thankful for and practice by saying them out loud in English. After saying two things, student Klári became apologetic and said, “I'm sorry it is very difficult for us to even think of something that we are thankful for. It is just not part of what we do in Hungary.” This lead to students discussing how the majority of Hungarians are pessimists and find it difficult to think in any other way. As we went further in the discussion, Tünde began to express to Miki the need to accept ourselves since God accepts us just as we are. There was a hint of her believing that we have the strength in ourselves to be godly. By God's grace, we were able to highlight the fact that if man was able to make his way to God there would have been no reason to send Jesus to save us from our sins. We talked about how we often want to do good, but have experienced constant failure and sinned. There was a perfect opportunity to share the Gospel with the morning class which made it an especially encouraging thanksgiving day. 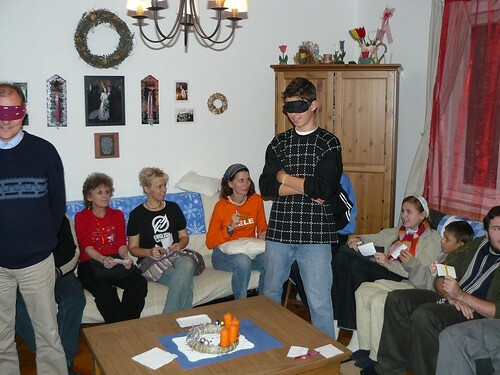 Above: Ben getting a free preview of our Christmas show. 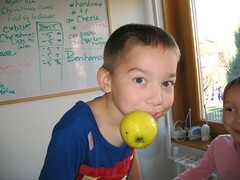 We are so thankful for the house God has provided once we returned to Hungary from furlough. 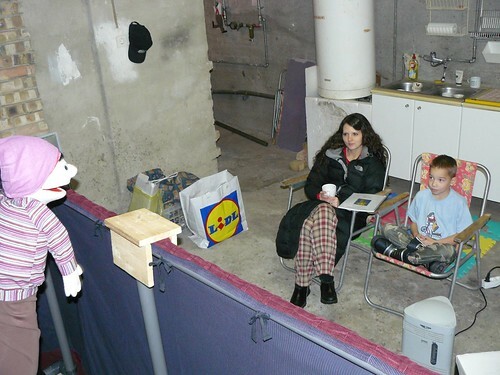 We hold a lot of ministry meetings and practices (like the puppet practice) in our basement. The weeks of preparations and practices are nearly complete. Starting soon from December 8-19th, we are once again privileged to take the good news to over 1000 children, teenagers and adults (combined). We have been allowed to enter 18 public schools throughout our target area for church planting for this year’s show. 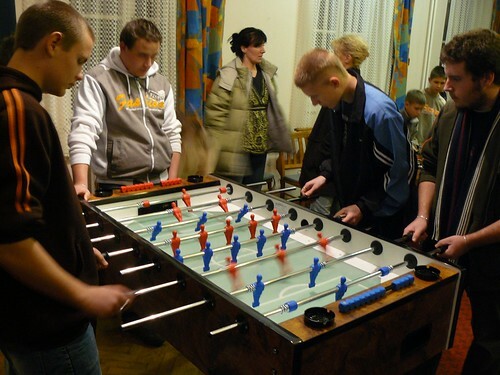 Above: Tonight we got to try out the new foosball table that God recently provided through a Hungarian church member. In the midst of game time, teenager Gabi passed out cards asking kids to write questions for Erika (Miki’s wife) who would be giving her testimony tonight. I was encouraged to see them take the time to write down what they were interested in hearing. 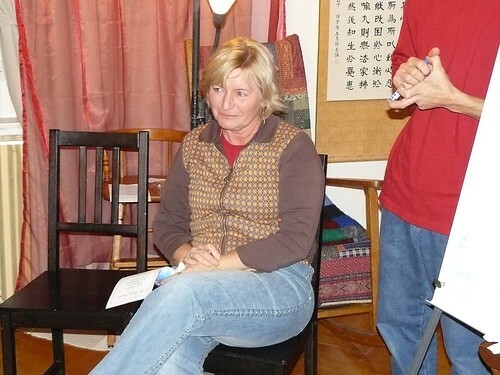 Above: Erika received questions such as, “How long have you been a Christian; Why is it important to know God; How did you meet your husband; Why does God allow wars and injustice in the world?” Erika was able to share her testimony about not coming from a Christian home and the process of God drawing her to Himself. It is always encouraging to see a handful of kids who are truly paying attention. This may be the only place where these teens are hearing about real life changes that Jesus has brought about and about the free offer of salvation for those who put their faith in Him. 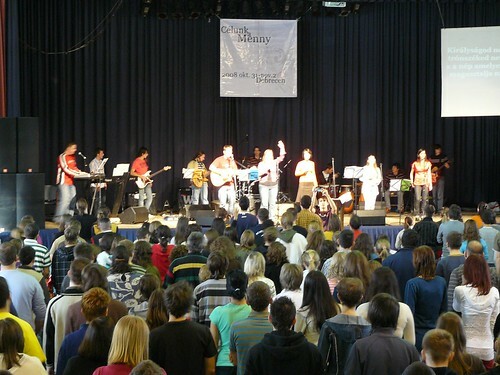 Above: Miki continuing to lead this small group composed of church members who are young in their faith. Church member Eszti shared how the worship music we sing in church comes into her mind from morning until night throughout the week. Another member added that when she has trouble sleeping, she begins recalling worship songs which lead her to praise and peace. It is encouraging to hear that these worship songs aren't limited to ministering to members on Sunday, but turn their attention to the person and works of Jesus throughout the week. 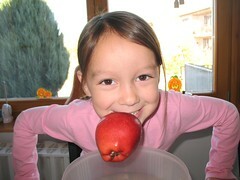 Above: Elianna having some fun before English Club starts. 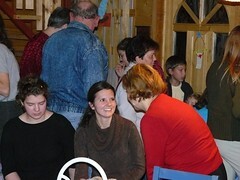 Above: Erika, Edina, Tünde and Klári talking to Brenda about Christmas traditions. 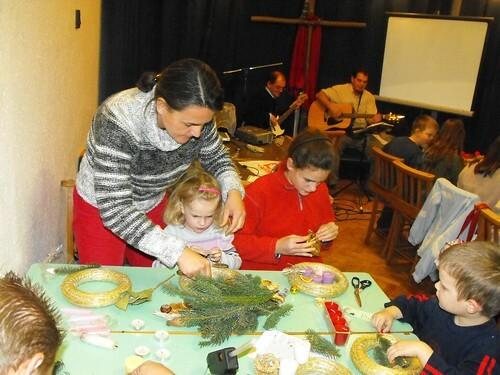 Above L to R: Klári and Tünde are two students that responded to an invite to our special church service this week which included a time for making Advent wreaths together. We are thankful that God moved them to take this first step into a place of worship. Please pray for Klári and Tünde to find the peace that Jesus offers to anyone who would call on Him as the Lord of salvation. 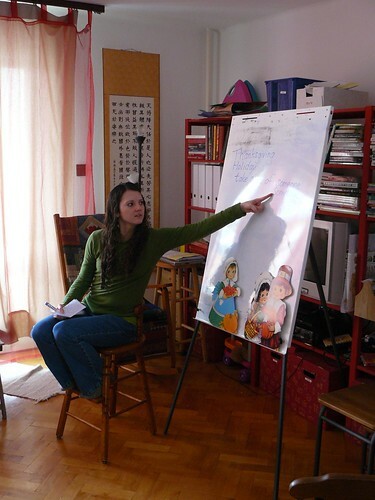 Above: Eszti and Kitti have been continually coming to our English Club and Teen outreach. We first met them through our VBS and we are thankful to have continued time to build relationships with them in venues where we are able to share the Gospel. Above: Each week there seems to be a few more new guys that attend as this outreach becomes known through word of mouth. This night offers them an alternative of going to the local bars or opportunities for mischief on the streets. 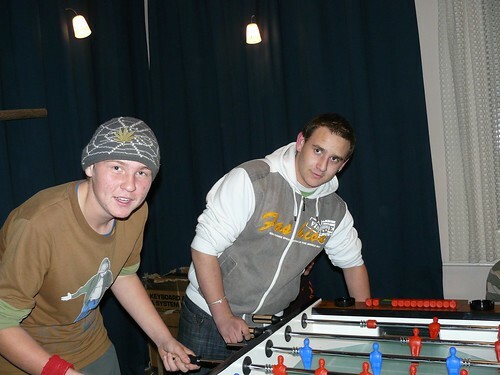 Above: DezsÅ‘ playing table football with Dávid. We have had this fuseball table for a few years, and it has been ready for retirement for months now. 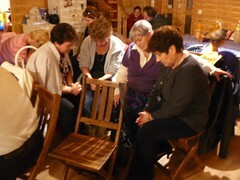 Fortunately, a Hungarian church member heard about the need and offered the full amount to replace it. God was gracious to lead us to find a used (more like an ‘open box’) fuseball table this week for an unbelievable price. It retails for over $650, but we were able to buy it ‘open boxed’ for $285. This has been a great tool to draw the youth off the streets into a safe environment. As our custom, after some hearty game time we take a break and gather the teens in a circle. Church members have been coming in and sharing their personal testimony to these kids over the past few weeks. This week DezsÅ‘ told his story of how God redeemed him from a destroyed life of a broken family and alcoholism to a new life of peace and purpose with God through Jesus Christ. I found out tonight (Sunday) that church member Eszti’s husband Peti, who comes to our teen outreach was thinking on the things DezsÅ‘ spoke even after returning home. Along with Eszti, we have been constantly praying for Peti to come to know Jesus. 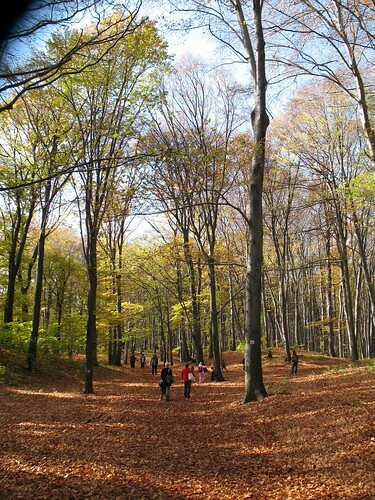 He shared with Eszti how amazing the story was and the life that DezsÅ‘ once lived compared to his life now. It is our hope that conviction will come upon all those who attend this outreach as they see where a life of sin leads and where the life of faith in Jesus Christ leads. Please lift up Peti in prayer. Pray also for his wife Eszti to continue to give testimony through her life (1Peter 3:1-2). Our marriage class is not very large as some have ceased from coming. For those that continue to attend, I am encouraged that God is changing their thinking and their goals in marriage to reflect His will. In Saturday’s class we talked about the danger of anger and bitterness forming deep roots in our hearts. We also considered the magnitude of God’s forgiveness for us and His command that we forgive in accordance to what we have received. Above: As mentioned above, Klári (pictured above) and Tünde responded to an invitation to tonight’s service. This was their first experience in our church and I was thankful that they were able to hear DezsÅ‘’s message as he continues to preach through the book of Romans. DezsÅ‘ spoke about how suffering is used in the Christian’s life to increase hope and expectation of the coming provision of God. After DezsÅ‘’s sermon, Julika shared about the four candles of the wreath symbolizing the prophets (who spoke about the expected Messiah), Mary and Joseph (Christ would be born to them), the shepherds (who were shown the glory of the Lord and told of Jesus’ birth), and the wise men (who saw His star and came to worship Him). 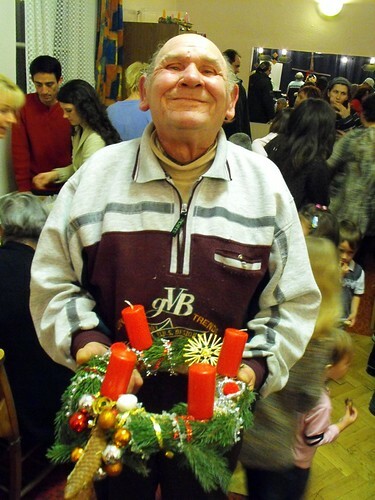 Above: Béla showing off his wreath. Please pray for our team this week as we are already preparing for our Christmas puppet outreach to 18 public schools in our area. We would ask you to pray for unity, protection from the enemy (sickness/injury), financial provision, success in practices and overall strength in a busy schedule. 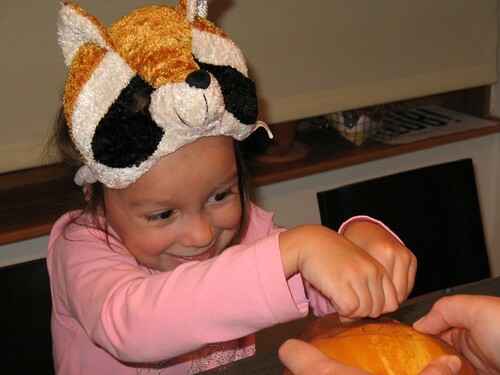 Above: Kira being cute in the kitchen. Above L: Student Tünde talking with Brenda. The morning session which has less students allows us to have more one on one time. We sense that we are developing friendships with the students and hope to launch an optional Bible study in the near future. Above R: Heidi talking with Kata (teenager Gabi’s mother) who is now a regular student. We are thankful for Kata spending more and more time with those from the church and seeing first hand the difference in our lifestyle because of Christ. 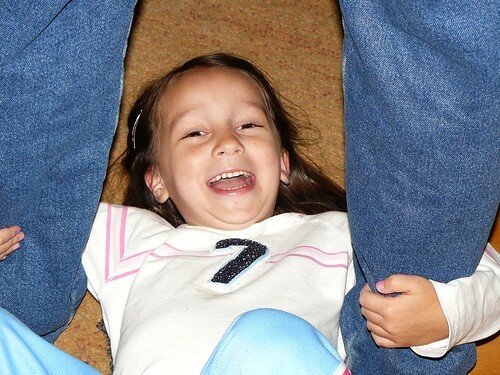 Please continue to pray for her and her daughter Niki to come to know Jesus. Above: Two teens who attended our VBS came to our club for the first time tonight. Eszti and Kitti (far right of couch). 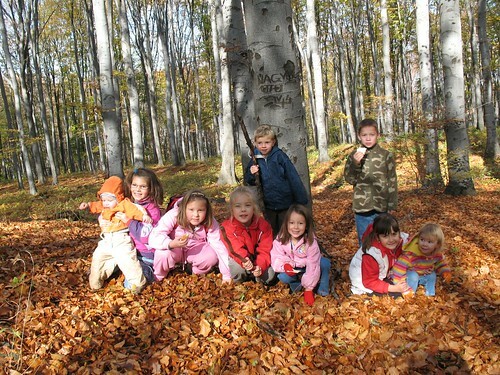 Above: We had our friends (Jack and Karen holding Elianna and Paul far right) from Budapest visit and participate in our English club. 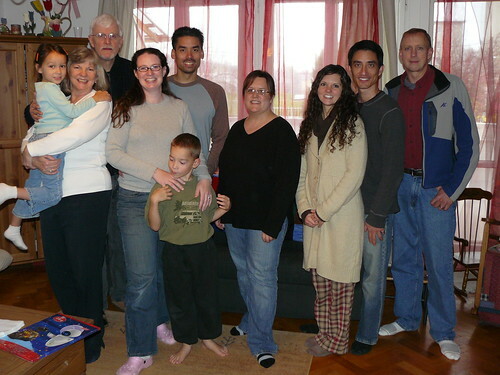 This is also a good shot of our church planting team (not including nationals) serving in PetÅ‘fibánya. Brenda (center) and Heidi and Roger do most of the organizing and curriculum for the English club. Heidi and Roger have just transitioned from Budapest and moved to PetÅ‘fibánya this week. 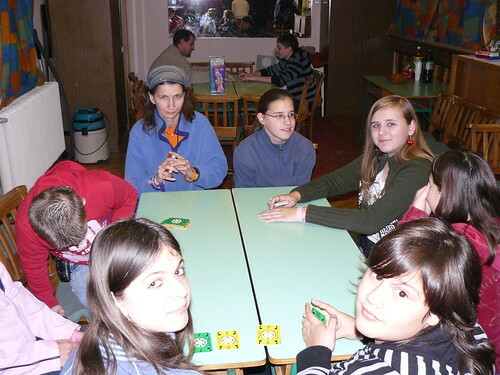 Above: Fun with various card games and also table football (mostly for the guys). After some time playing games together, we have begun a series of church members sharing their testimony as to how they came to believe in Jesus Christ. Two weeks ago, I spoke about the emptiness of life without God, last week Peti spoke about his new life in Jesus and tonight, Peti’s wife told the story of her faith in Jesus. We were thankful for the time of sharing to be free from distraction. As these teens hear both the gospel and personal testimony of how Jesus Christ transformed our lives, we pray that they would begin to seek for truth in their own lives. Above: My right hand man (pictured on my left) Gabi helping with various responsibilities in tonight’s ministry. Gabi continues to live out his faith, and shared stories with me about how God was teaching him more about forgiveness and prioritizing his time in order to faithful carry out those responsibilities that God has entrusted to him. Please pray for Gabi to continue to mature in his faith and knowledge of the greatness of God. 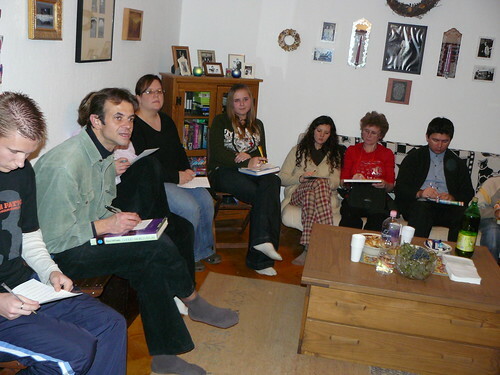 Our custom in class is to break up into a men’s group and women’s group for part of our teaching. Because of various factors, we sought to break into groups strictly for prayer and then return to a larger group for tonight’s Bible study. I praise God for these times where we can be honest about our lives with each other, seek to encourage each other and pray for one another. My group included DezsÅ‘ and Gabor with Miki joining us a little later. Before we began prayer, I facilitated a time of basically asking “How are you really doing?” Gábor opened up and shared some of the trials he was presently going through. DezsÅ‘ with Bible open began to offer encouragement and teaching to help him process these trials with a proper perspective. I offered some teaching off and on, and was just thankful to see true Christian fellowship happening. The deep issues on men’s hearts often stay there, but this group allows us to put everything in the light and encourage each other. Praise God for using the members of His body to edify! Allen did not make it to the Church Planter Team Leader Retreat because of an unexpected path we were called to take this weekend. The tension of not receiving what we had hoped in the now, and not seeing what we had hoped to see in the now increases our desire to see how God works this out for good in eternity. Sharon and I have an expectation in a future that is good because we worship a good God. In a time of great loss, Job was able to say "The LORD gave, and the LORD has taken away; blessed be the name of the LORD.” We proclaim the same, and we do so with the advantage of having a fuller view of God's love and desires revealed to us through Jesus Christ. He proved the deepness of His love by sending His only Son to suffer and to die on the cross to pay the penalty for our sins and rescue us from judgment and hell we deserved. We have no trouble therefore trusting into His hands those things we can not fully comprehend. The grand expression of His love, and the supernatural provision of peace and comfort through this time give us even more confidence in Him. These pains we experience in this fallen world enlarge our expectancy of a joyous and fulfilled future in eternity with Jesus.— Allen and Sharon. Above: Sharon went on a hike with some friends from the neighborhood recently in the Matra mountains. Above: A little halloween fun. 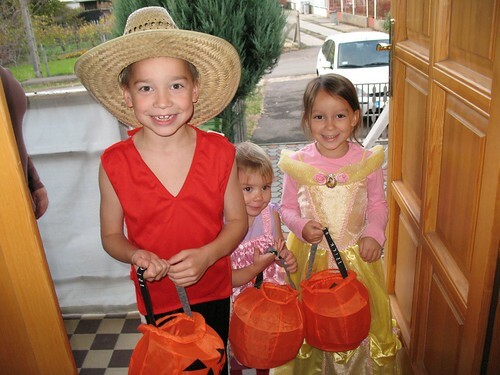 Since our kids couldn’t be in the US with their cousins going door to door for candy, Sharon had them dress up and knock on various doors in our home. Neighbors and some walking by on the street got a kick out of seeing the kids dressed up on our front porch. 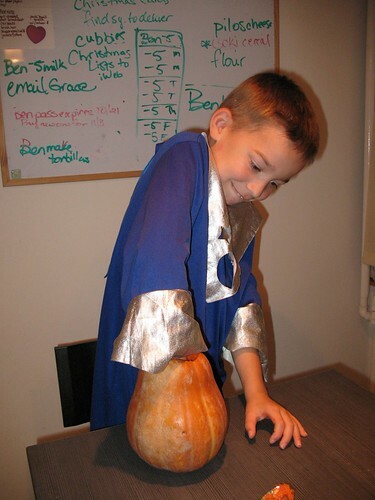 Above: Sharon had the kids bob for apples and go to town on pumpkin carving. What a fun mom. Allen will be away for the weekend with fellow PI church planters from various regions throughout Europe. We look forward to a refreshing time of fellowship in Christ and will seek God’s will and direction as we discuss various methods and movements in Church planting. Please pray for all those who will attend to receive clear revelation of next steps in ministry and also to be built up and encouraged through our time together. 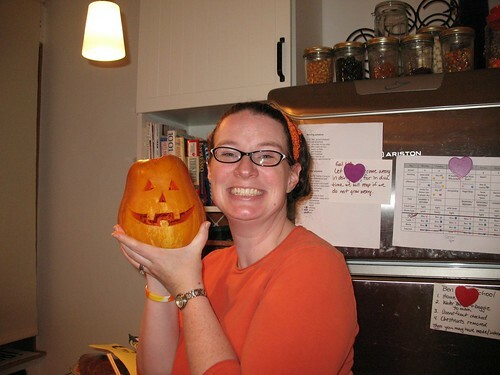 Pray also for Sharon who will be ‘home alone’ with the kids while Allen is at the conference. This past weekend, Allen and Miki took some teens from PetÅ‘fibánya to a teen conference in Miki’s home town of Debrecen (second largest city in Hungary). The teaching, preaching and worship at the conference was excellent. The gospel was clearly communicated and multiple opportunities were given for the hundreds of teens attending to put their faith in Jesus. Above: Petfibánya teens, Niki and Dia. Above: Allen and Hugi. Hugi helped us by chaperoning Niki and Dia. Hugi is a church member and because of a disability does not have a job. 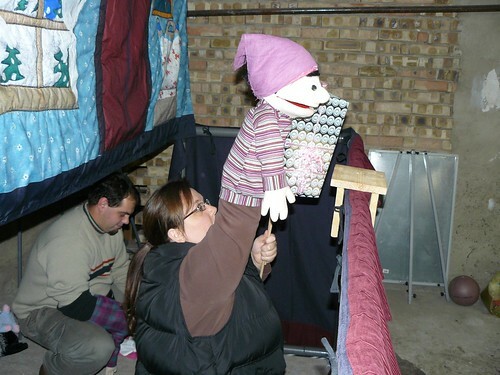 This allows Hugi to join us in many ministries like this conference and serve with us in our puppet ministry. Hugi also benefited from the encouraging and challenging messages this weekend. Above: In Hungarian, when you hear someone yell, “Small apartment” you better run. I didn’t. You may be able to see me at the bottom of the pile up laughing and gasping for air. 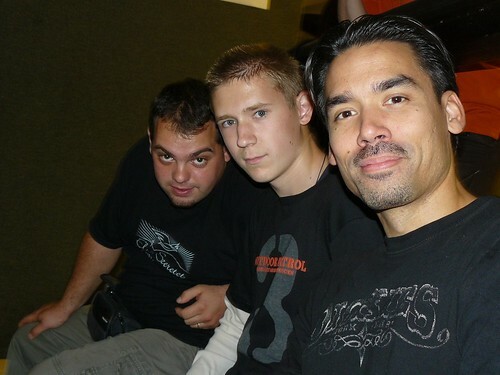 Above: Miki, Gabi and Allen. On the final day of the conference in a special worship service, the pastor asked those who would be participating in the Lord's Supper to stand. When Hugi saw teens Gabi and Zoli rise to their feet in unison with hundreds of other young followers of Jesus, she was overwhelmed with joy that God had given them the privilege to know Jesus as teens. They teens that came with us who are not believers had a very positive experience and I believe many seeds of truth were planted in their hearts. The greatest encouragement came in our church service last night. After a time of worshiping God with song, I gave the church the opportunity to give thanks to the Lord. After a few members took turns praising Him, Niki spoke out in prayer saying, " Lord, thanks for the opportunity to go to Debrecen, to be around so many nice people, so many people that believe and trust in You. And thank you for leading me closer and closer to Your light." Above: Times of fellowship and prayer in our worship service. As we were returning from the teen conference expecting to use our regular meeting place at the local community center, we received some bad news. The second floor of the building is being renovated and new finish was just put down on the floors which filled the building with dangerous fumes. Miki was kind enough to open his home for church in place of the community center. An hour later, we were gathered together to praise God. 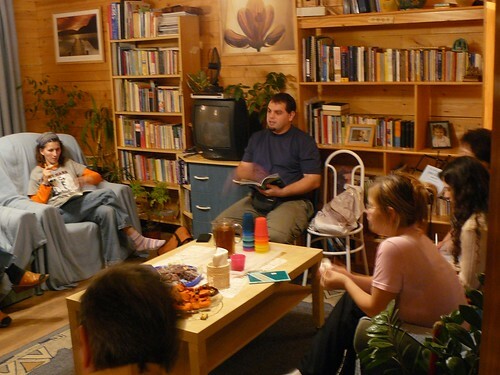 We were thankful for returning guests, Kati (teenager Gabi’s mom) and Béla (teenager Dávid’s father). Also, Istvan and Marika who have been coming off and on to our marriage Bible study came with their four kids. Peti delivered a message about our tendency to fear rather than have faith in God who cares for us. This is a deep rooted problem in this culture with widespread pessimism and hopelessness. 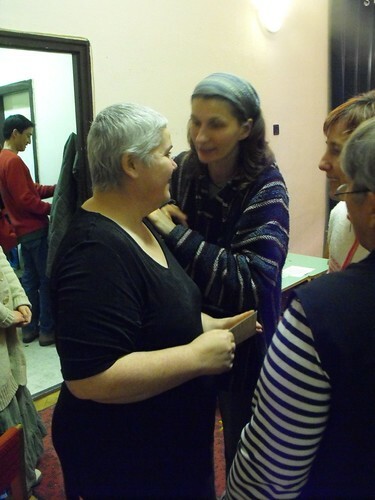 Hungarians often struggle with a fear that turns into faith that something negative is bound to happen. His message stirred the body to consider God as their Father and to take a stand against fear by putting their trust and hope in God who is able to provide an unseen solution. "Cast your anxieties on Him because He cares for you"